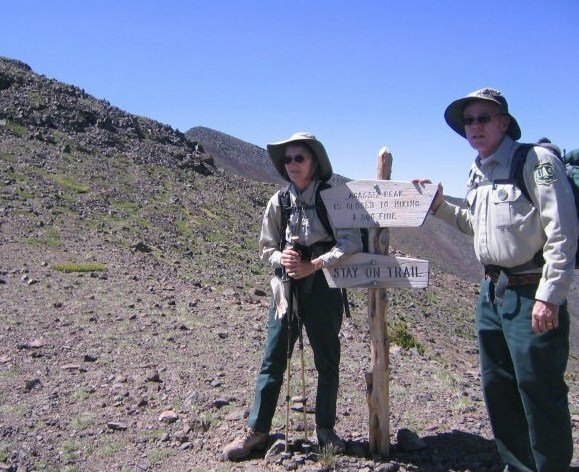 While the Forest Service and other NGO’s provide most of the efforts on behalf of the forest trails near Flagstaff, FoNAF does assist in a few significant ways. When the trails are free of snow a work party begins the process of opening the more heavily used ones like the Humphreys Peak and Kachina. This process continues throughout the summer season covering all 250-300 miles of trails in the Flagstaff Ranger District. Typically the work party consists of three or four persons using a hand-powered crosscut saw. At the entry point of each trail into the Kachina Peaks Wilderness there is a trail register box containing a log of those who pass. FoNAF volunteers assist the FS in maintaining these logs and providing new ones as needed. This occurs on an irregular basis. Signs indicating such things as wilderness rules and regulations are placed along various trails to inform users. On an as-needed basis FoNAF volunteers assist the FS in erecting and maintaining these notices. To contact the Trail Maintenance Coordinator for more information click here.